Like most hormonal birth control pills, some women find that they gain weight on Yaz. However, the evidence that Yaz directly causes weight gain is scant, and a 2008 study published in "Medicine and Science in Sports and Exercise" found that healthy, active women did not gain weight when taking hormonal birth control pills. Some women take Yaz to treat premenstrual dysphoric disorder and acne. However, these symptoms can also be caused by polycystic ovarian syndrome, an endocrine system disorder that can cause weight gain. If you notice that you're suddenly gaining weight -- without changing your diet or fitness routine -- talk to your doctor. He may examine you for symptoms of an endocrine system disorder. Some women react poorly to specific birth control pills, so your doctor may also recommend switching to a different pill. Before you embark on a weight-loss plan, take a look at your diet. Keep a food log to determine how many calories you're eating each day, then ask your doctor to help you calculate how many calories you need at your current weight and activity level. Cut out sources of empty calories, such as sugary drinks and high-calorie snacks. Eat berries, nuts and vegetables for snacks instead, and focus on eating several small, low-calorie meals throughout the day to feel fuller. If you can eliminate 500 calories a day from your diet, you can lose a pound a week. The U.S. Centers for Disease Control and Prevention recommends at least 75 minutes of vigorous cardio or 150 minutes of moderate cardio per week. Activities such as running, swimming and jumping on a trampoline can help you burn calories, but if you're not reducing calories from your diet, you may need much more exercise than the CDC's recommendation. For example, a 185-pound person will burn 311 calories cycling at a moderate pace for 30 minutes. You'll need 5.5 hours of cycling per week to lose a pound if you don't diet. 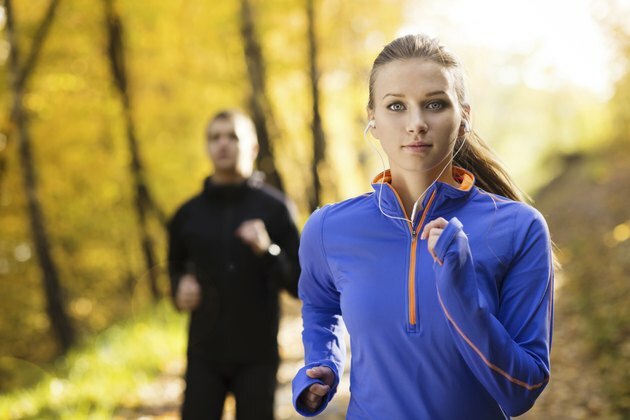 Simply increasing your daily activity level can help you lose weight. For example, try cycling to your neighbor's house rather than driving, and take time to run around in the backyard with your dogs or children. When you're sitting at your desk and working, take breaks every 30 minutes to stretch and walk around. Cooking forces you to stand up and move around, and standing or pacing rather than sitting to watch television can burn a few extra calories. U.S. Centers for Disease Control and Prevention: How Much Physical Activity Do You Need?